(Host intro) Burlington’s Vermont Stage Company opens their new season with the post-modern memoir, "Well". Well was written by New York City playwright Lisa Kron . Kron describes it as "a solo performance with other people". VPR’s Neal Charnoff went "Backstage", and filed this preview. The play begins with the character of "Lisa", announcing her intention to tell the story of her road to physical and emotional "wellness". And her opening monologue to the audience promises to explore how Lisa’s play might help her work out her relationship with her mother. (Lisa) "What is that thing about being around your parents that makes you act like a 13-year-old? You know what I mean? You grow up, and you start your own life and you move away, and you do therapy, and you get some distance, and after while you start to be able to see your family so clearly, and you think, wow, the next time I go home I am really going to be able to help them out. But then when you get home, what you realize is that your parents live in an alternate universe, where your therapy has no power." (Charnoff) What begins as a straightforward remembrance evolves into a "meta" play where the conventions of theater slip away, and real-world logic dissolves. If fact, Lisa’s mother is downstage sleeping in her La-Z-Boy, and after being wakened from her nap, she interacts both with Lisa and the audience. (Mother) "Did you offer these people something to drink? (Lisa)) "No mom, they’re fine." (Mother) "Lisa what’s wrong with you? What would you people like? "Let me see what we’ve got." (Lisa) "Mom they don’t need a drink, they’re fine." (Mother) "Okay we have Coke, some Diet Coke, and Verner’s…"
(Mother) "…root beer if anyone want that, I don’t know if any of this stuff is still good. You know…"
"… I buy this stuff when it’s on sale, and then it just sits here…"
(Lisa) Okay, we’re not going to compliment this thing with drinks. (Mother) "… there’s something here with some kind of fruit nectar Ellsbeth brought back from Holland. I don’t think I’d have the nerve to try that. Okay, what’ll you have?" (Charnoff) Lisa’s mother has had a lifelong battle with illnesses that are both real and imagined. Lisa herself has been to a wellness clinic to battle allergies. Her play is meant to be a vehicle to explore themes of family and illness, but her mother keeps hijacking the narrative, and the audience’s attention. (Mother) "You’re not writing a play about me, are you? (Lisa) "Mom, we’ve talked about this before. I don’t actually write traditional plays. I work more in the genre of solo performance." (Mother) "Okay, this solo performance, is it about me?" (Lisa) "Well this isn’t actually a solo, there are other people in it. It’s like solo show with other people in it. It’s a whole new thing." (Mother) "Wow, that sounds great. What’s it about?" (Lisa) "It is a multi-character theatrical exploration of issues of health and illness, both in the individual and in a community. Did you wanna read the grant proposal?" (Mother) "No I just want to know what you’re doing and if I need to go upstairs and hide until you’re done. I don’t even like to have my picture taken, I certainly don’t want to be in a play." (Charnoff) "Well" debuted at New York’s Public Theater in 2004, and moved to Broadway in 2006. Artistic Director Mark Nash chose the play to open Vermont Stage Company’s new season. Nash says that he likes the "meta-theatricality" of the play. (Nash) "I like the sense that it’s a play that knows it’s a play, and tells you that it’s a play, and then surprises you that it doesn’t seem to be the play that you thought it was, and that surprise is a lot of fun for me." (Charnoff) Lisa is played by Lisa Barnes of New York City. She agrees the play’s structure is a bit of a puzzle, and compares it to the infinite loop of an M.C. Escher print. Barnes says that on one level, the play allows the playwright to work out and make sense of her relationship with her family. (Barnes) "It is about differences. We love to just assume that the world is what we think it is. Make it nice and neat. And it’s not nice and neat." 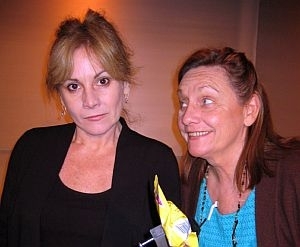 (Charnoff) Lisa’s mother is played by Dale Soules of Brooklyn, New York. For her, "Well" is about walking a mile in her daughter’s shoes, and vice versa. (Soules) "In this play the questions are about illness and wellness, and about integration, and how do we integrate those that we don’t understand into our world, and accept them. Everybody wants to be accepted. Everybody wants to be noticed for what they do well, not for what’s so different about them." (Charnoff) Dale Soules says that children are eager to "fix" their parents lives, but must accept that their parents have their own prior lives that made them who they are. This theme is summed up by Jim Gaylord of New York City, who is directing "Well". (Gaylord) "I think its about our relationships with our parents, which become our relationships with ourselves, and how looking at those relationships as we delve more deeply into them, as we begin to face them, especially for that group of us who are growing older and possibly losing our parents, it’s through our relationship through our parents that we finally find our own integration into who we are as people." (Charnoff) The Vermont Stage Company production of "Well" opens tomorrow night at Flynn Space in Burlington, and runs through November 2nd.